i’m in such a hurry that i don’t have time for the shift key…here’s a quick rundown…kenya is beautiful, but i’ve seen very little so far. i’ll have more to say in 6 weeks. i’m still a bit jet lagged but i’ve been having a good time…all of the students, teachers, etc. are awesome…really nice and it’s great to talk to people who are interested in a lot of the same things as i am. we met some very nice kenyan women the other day and they gave us lots of tips on safety, language, tribal groups, etc. really sweet and they all have kids…single, working moms. probably my age or younger. the food has been good…excellent indian food. but stuff is kinda pricey here…much more than in ghana. still, i’m sticking to a pretty good budget. 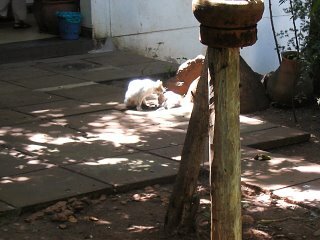 there are lots of feral cats hanging around everywhere…mousers i gather…some cute kittens…i got some pics with my snazzy digital camera of a momma kitty cleaning her baby. 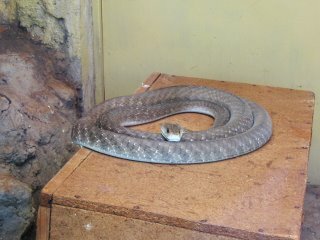 oh and we saw lots of snakes today at the museum…live ones! we saw black mambas and puff adders….the two deadliest…they’re not very big…hard to believe something that small could be that deadly, but there you go. some of the guys who’ve been to the field school previously have given us the lowdown on some of the bigger insects up at koobi fora…apparently there are giant, 10-legged spider critters with two sets of fangs…and yet….they’re apparently harmless…i’d give that quotes but it’d take too long. okay…i really have to go or else they’ll leave without me! i will be in touch again in about 6 weeks. I started this travel blog like two years ago…I haven’t really gone anywhere since then, except to San Diego and then to Indiana for Xmas…clearly, I wrote nothing about those trips. But now I’m going to Kenya…yep, back to Africa…so I have something pretty big to write about. Sadly, I’ll be in a remote area for most of the time and unable to access a computer. Such is the way of things. So I’ll write when I get to Nairobi and you’ll have two…count’em…TWO…blog entries to read! Maybe I’ll even take a photo of the airplane or my hotel. Tommy (my brother) has given me a digi camera, so I’ll be able to load images unlike last time (“last time” refers to my trip to Ghana for those of you didn’t know me then…and for those who did, hopefully there will be fewer detailed descriptions of cockroaches this time…I’ll just take a picture!). Alrighty then…talk to you soon.